Here’s another goodie. 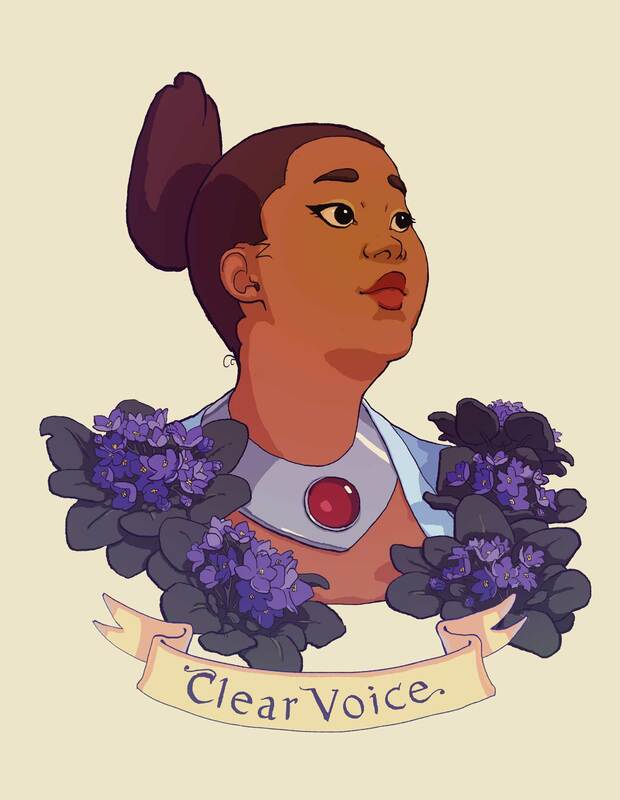 The poster below of Margravine Paradzul P’Lanssyr, with violets and a ribbon proclaiming “Clear Voice.” I would love to print this poster, but I need a just little more money to pay the printers. You can help by supporting my Patreon, purchasing items off my Gumroad shop, or by sharing Nwain with your friends–free and fun! Hello, dear readers! I’ve got a couple of goodies for you! First, this musical interlude by Justin Jacox. Journey to a Mysterious Land is an instrumental piece about Nwain Chapter 2, featuring the sounds of the robot haven Far Listener, and Nwain’s journey through it. This music was made possible by the support of Nwain readers on Patreon. This is the first draft of what will become an interactive map. I hope to make it both spiffy and informative, with different layers you can turn on and off. Planned layers include: terrain, political… and I’m not sure what else! 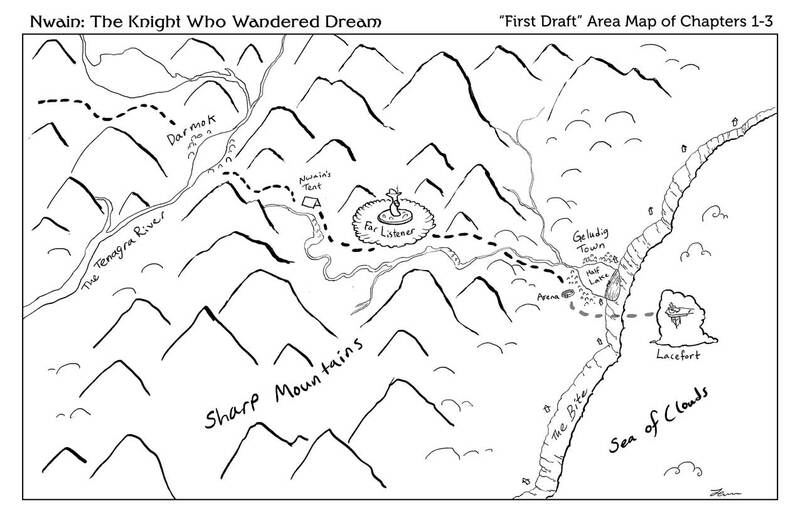 If you’ve got questions that can be answered within this map, feel free to comment, and I’ll be sure to put it in. The people of Sundial City have a unique way of looking at gender. To them, gender is purely about social roles, and defined entirely by one’s behavior in society. The location where one works generally determines what gender one is expected to choose. The Sundelian gender spectrum is centered on the home, and radiates outward from there. Omith do their work at home. Often, they are the central figures of the family, or direct underlings to the head omith (cyclomith). They wield the greatest power out of all the genders. They control access to the house, and they are responsible for everything and everyone within it. Noble cyclomith manage great swaths of land and people from within their estates in Sundial City. Frequently, they send wef proxies to the Gnomontower to advocate for the cyclomith’s views about law and governance. The monarch is typically an omith, with the whole of Olkas Island considered the ‘home’ which they oversee. Omith have the privilege of being considered highly competent, trustworthy, and responsible. They receive the benefit of the doubt in most cases. They are also the most numerous; ideally, every home has an omith to manage it. Wefs do their work outside the home, but still on Olkas Island. When farmers collect ripe olives and merchants set up their stalls, they are doing wef work. The judges at the courthouse and stevedores on the docks are wefs. A maid who leaves their own home to work in another’s is a wef, while a maid who lives at the same home they work in is an omith, and outranks the wef maid. Often wefs will take goods created by an omith’s home industry to the market to sell. The marriage between an omith and an wef is thought to be an ideal marriage. Wefs are considered the most likable and outgoing of the genders, and second-most industrious (following omith of course). Salts do their work on the sea. Everyone from those who catch anchovies to the High Admiral are salts, generally. They are considered to be healthy, adventurous and easygoing, as well as dangerous, reckless, and overly emotional. A marriage between salts is considered tempting fate. “If a storm hits while they’re all at sea, who will take care of the children?” is the sort of thing people will whisper at the wedding. Faewefs do their work on land that isn’t Olkas Island. Faewefs include ambassadors, soldiers, knights, generals, and merchants who travel to do foreign trade. They comprise the smallest minority of the genders, but many wield considerable wealth and might. They are thought to be worldly, brave, opulent, and deserving of glory (when victorious), while also tainted by foreign ways, pointlessly stubborn, stingy, and deserving of ridicule (when defeated). A marriage with a faewef is expected to be fraught with accusations of infidelity on all sides. As it is fairly common for people to change career, so too is it common for Sundelians to change gender. Starting at age eight, and every eight years thereafter, a Sundelian will undergo a ritual ceremony wherein they declare their gender, and this gender is acknowledged and recorded. Even those who wish to retain their gender undergo this ceremony. Everyone starts life as a yith. At age eight, they declare a gender for the first time. By doing so, they speak for the direction they want further occupational training in. Often, children are groomed by their parents to lean toward one or another, especially if they have a family business or an ancestral home that will need to be maintained for generations to come. Because of this, higher class children often experience significant pressure prior to their first declaration ceremony. As the declaration ceremony is semi-public, one’s gender history is often public knowledge. The ritual itself covers both the declaration to change gender and the declaration to keep the same gender. What is celebrated is the will of the individual, not their particular choice. Having a history with at least one transition is expected, as a rule. Lifelong yith are uncommon. An eight-year-old child may decide to stay a yith, and this is forgiven for the first declaration ceremony, and generally chalked up to indecision. If on their second declaration ceremony, at age sixteen, they again chose to stay a yith, it is thought to be a bad sign for the child’s future. Either they are incompetent, lazy, or philosophical, none of which bodes well for their practical use to the family. Often a Sundelian will hold a job that does not match their current gender. This is considered mildly rude, and they will be overlooked for advancement until they change gender or occupation, or if they can prove their competence (omith have the advantage here, since they are assumed to be competent). Wef: Chancellor Resin Dawnwaker, speaker for Cyclomith Frezzad of the Dawnwaker house. Salt: Admiral Lazrith Nightbeam, Nwain’s brother, lost at sea. Yith: Laidth Nwain Nightbeam, a monk, a knight, and other things; a lifelong yith of various talents. If you’d like any clarifications, feel free to ask in the comments! Nwain March 2016 Pledge Drive! Nwain: The Knight Who Wandered Dream is created by one person (me). It’s a surprising amount of work! I spend over 40 hours a week doing work on the comic, from animating and writing to marketing and bug fixing. It leaves me no time to work at a traditional 9-5 job. To make ends meet, I occasionally take freelance illustration commissions. Sadly that work isn’t steady, and it can take time away from Nwain. There are better options out there. Merchandise is one option. At the Nwain Gumroad shop, you can buy Nwain-related items, or download digital goodies at a pay-what-you-want price–great for a one-time donation! I also sell the physical items at conventions, such as the Evergreen Tabletop Expo in Tacoma (May 27-29) and possibly Geek Girl Con in Seattle (Oct 8-9). Patreon is another option. Patreon allows you to make monthly pledges. 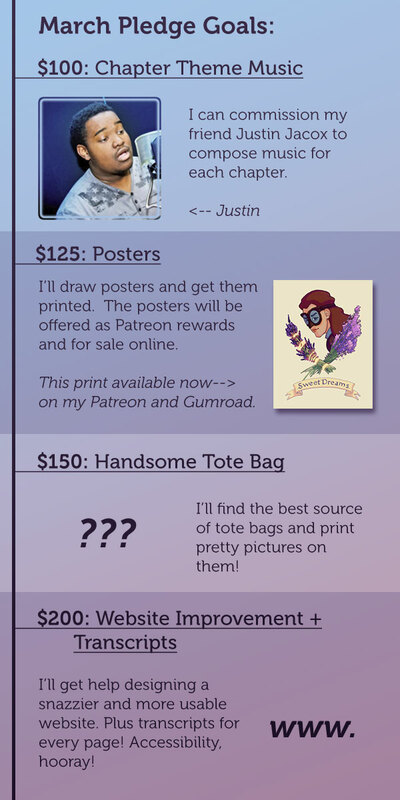 Depending on your pledge level, I can send you rewards. I like Patreon because it is very steady and low hassle. An increase in support means I have funds for getting new merchandise printed or crafted. The only catch is that my Patreon tends to grow slowly. So that’s why I’m holding a pledge drive! 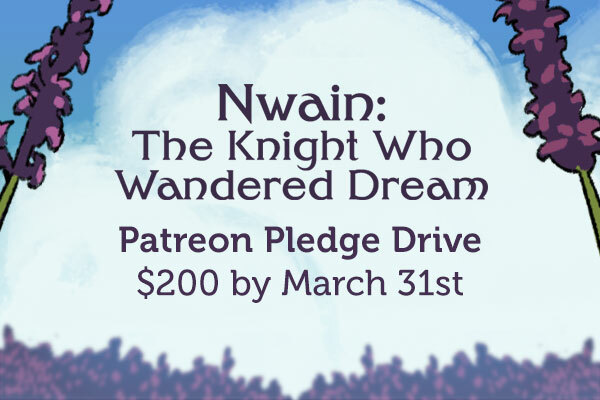 Like pledge drives for PBS, I’m doing a month-long reminder: if you’re interested in supporting Nwain, now is a great time!